The Faroni and Pikcilingis families purchased a multifamily in Belmont in 2010. Today, the cousins’ five kids play together like siblings. My mom grew up in a three-story home typical of Greater Boston: We call them “multifamilies” nowadays, but they were “three-deckers” a generation ago, at least on Andrews Street in Lowell. Nana owned two of them, side by side. My grandparents, uncle, and mother lived in one apartment; my great-grandparents were on another floor; and my mom’s cousins resided on yet another. At dinnertime, Nana banged on the pipes to rustle up her father for supper. Next door was a parade of Irish characters that rented for eons, a kind of wacky “Upstairs, Downstairs” arrangement that revolved around church gossip. My favorites were Margaret and Mac, a couple who lived there for 50 years and let me make prank phone calls on their rotary phone. They left a rent check on Nana’s porch every month. I don’t think getting a mortgage of their own ever occurred to them. It seemed like a cozy, supportive way to live — something that gets a bad rap today. Every week, there’s a morose headline chronicling the dependent regression of jobless millennials forced to move in with their parents. What happened to the good old days? In this pricey market, I wondered whether people of all ages would voluntarily enter into such an arrangement with their families to share expenses, and maybe even child care, as in days of yore. The answer is yes, but it’s more complex than in my Nana’s time. Finding such a situation takes luck and pluck, experts say. New housing stock for multifamilies is low: Many are renovated and sold as condos; other owners hang on to them as rental properties. (With the average apartment rent topping out above $2,000 in Greater Boston, multifamilies are an investor’s dream.) In Waltham, which is rife with such housing stock, many people have owned their inherited multifamilies for 30 or 40 years, with the kids firmly entrenched, renting a floor, according to Globe Ask the Realtor writer Anthony Lamacchia, a Boston-area broker/owner based in that community. “Year to date, there have been 11 two-families that have closed — compared with 44 single-families and over 240 condos,” noted Josh Muncey, a real estate agent who specializes in that neighborhood. “If you’re a landlord and you have rental property, you’re hard-pressed to find a better investment.” Why unload it? Plus, many multifamilies that do sell are quickly snapped up by developers with cash in hand or by new investors eager to rent out each floor. “Many developers and investors are competing for these properties, so when [a family] finds one they like, there might be multiple offers, and they’re likely to be competing against cash buyers. 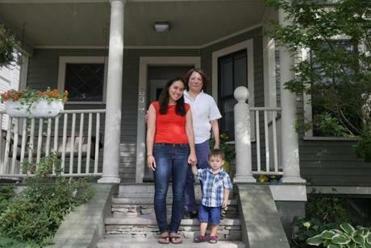 Families need to be patient,” said Muncey, who’s with RE/Max Destiny in Jamaica Plain. This mirrors statewide statistics. In May, there were 1,956 multifamilies for sale statewide — a 33.2 percent drop from the same time last year, according to data from the Massachusetts Association of Realtors. But for the fortunate, there are big benefits. Take Michelle and Alex Faroni, who snagged a Belmont home in 2010 by buying a multifamily with Michelle’s cousin, Aaron Pikcilingis, and his wife, Laura Burnes. “My grandfather owned a property with one of his relatives. One of my earliest memories was get-togethers in their backyard with my cousins and how special it was, so I romanticized [the arrangement] in my head,” Alex said. “We sat down and wrote a letter to the sellers telling them what we’re telling you: The idea of our kids growing up together was huge, and we wanted to take advantage of that,” Michelle Faroni said. 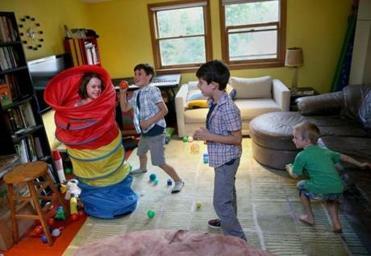 From left, Eloise Pikcilingis, 7, Truman Faroni, 7, Alden Faroni, 8, and Milo Pikcilingis, 4, play on the third floor of their families’ home. Today, the cousins’ five kids play together like siblings, they said. And the adults, who just so happen to be close friends, were able to afford far more than they would have alone. “Belmont would have been off-limits and over our budget,” Michelle said. Pooling resources gave them more spending power, but commingling finances and family can muddle even the most Rockwellian scenario. What if someone wants to move? What if someone can’t make the mortgage that month? The Faronis had to act fast for their bid, so they made a joint offer first and drew up a legal document splitting responsibilities and finances later. They eventually turned the home into independently deeded condos, so either family could sell without leaving the other one stranded. This can be rocky, though, even if your housemates gave birth to you. Leigh O’Sullivan Flannery lives on the first floor of the Cambridge multifamily where she grew up. 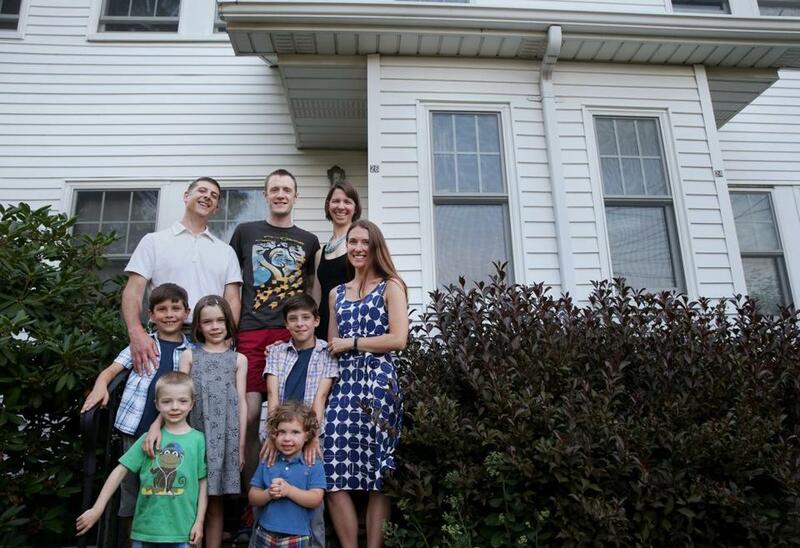 She, her husband, Michael Flannery, and their four children (ages 9 months to 9 years) have rented the apartment for eight years from her parents at a below-market rate. They pay enough for them to cover their mortgage, she estimated. Her parents see their grandkids all the time — though not before 7 a.m. and not without ringing the doorbell — and the family saves on child care. But it has raised financial issues, too. The Flannerys are paying for a basement renovation; they also contribute substantially to household upkeep. The issue? Flannery and her two siblings will inherit the home someday. But the give and take of living with family can outweigh prickly issues — so much so, in fact, that some families not fortunate enough to find multifamilies have bought tandem condos instead, like Eric and Stephanie Heckman and Stephanie’s mom, Gertrudes Euler. 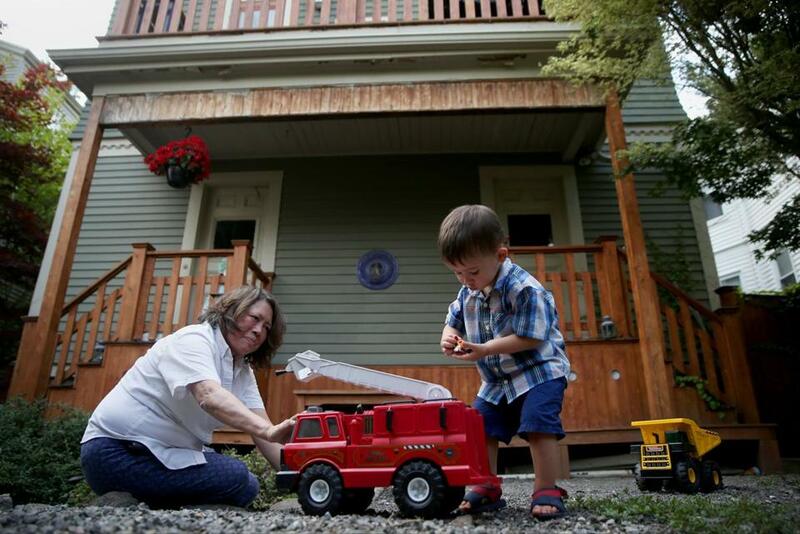 From left, Stephanie Heckman, her mother, Gertrudes Euler, and her son, James Heckman, 2, in front of their Somerville home, where they live in tandem condos. The Heckmans found a condo near Somerville’s Teele Square in 2012. In 2013, Euler relocated from Tennessee and in 2014 moved downstairs from the couple. The market was tight, but her cash offer helped. “If you asked me five years ago if I’d be sharing a house with my mother, I would have said you were crazy,” Stephanie said. Now, she and her husband are delighted — especially since they have complex work schedules and a toddler in day care. The families pool condo fee expenses through an association, though there’s friendly give and take. For instance, Euler swings by with banana bread. Parents can get a lot out of the arrangement, too. After Lyn Shamban’s husband died in 2010, she wanted to leave suburban Sharon for somewhere urban. Her daughter, Debbie Gorsky, was house-hunting in East Arlington with her husband, Daniel, but they couldn’t find any single-families they liked in their price range. “We were committed to finding a two-condo situation, and we didn’t want to live in a random condo with just anyone,” said Gorsky, the mother of two boys, ages 2 months and 3 years. “My mom had said that if we were going to move to Arlington, she would want to downsize and move to Arlington as well. I was sheepish at first about asking my husband. I was shocked he was an automatic yes,” Gorsky recalled. James Heckman plays with his grandmother, Gertrudes Euler, who sometimes baby-sits him after day care. 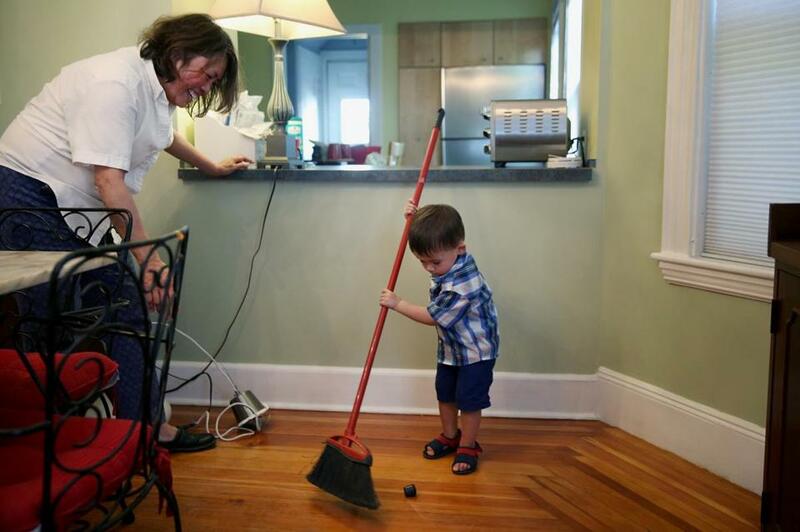 James sweeps his grandmother’s dining room. Euler lives on the first floor, and her daughter’s family is on the second and third. 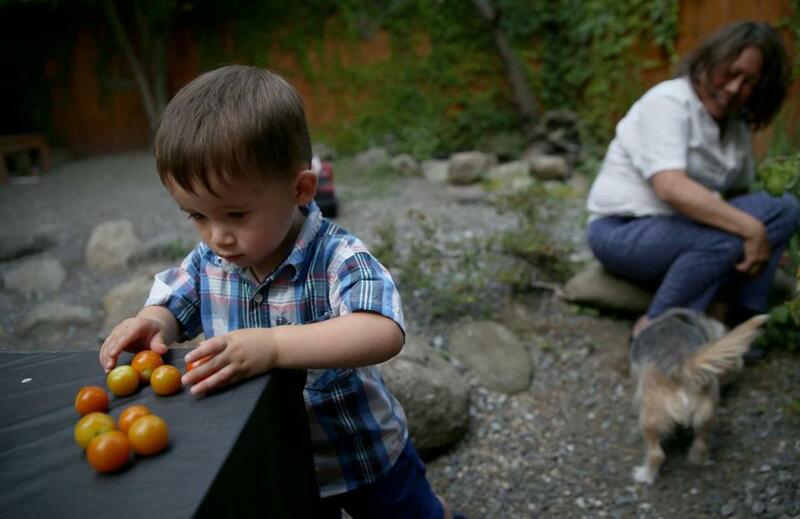 James collects tomatoes with his grandmother. 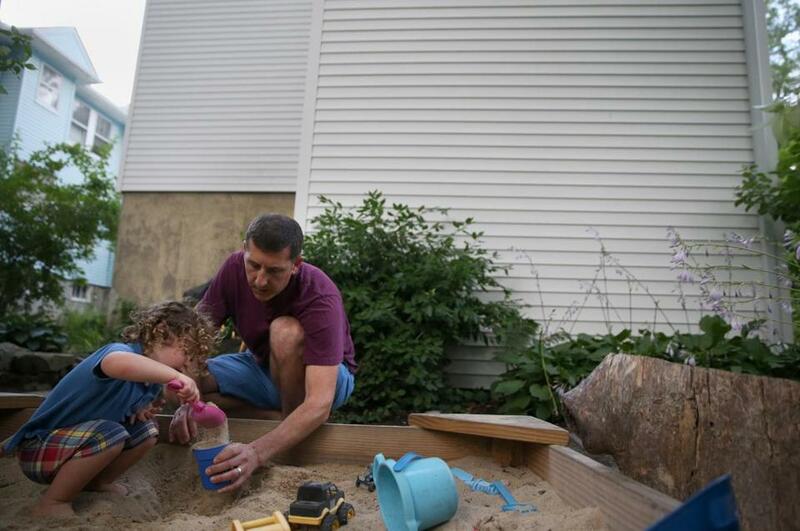 Lennon Faroni, 2, plays with his father, Alex, in the sandbox behind the house they share with cousins. Kara Baskin can be reached at kcbaskin@gmail.com. Follow her on Twitter @kcbaskin.